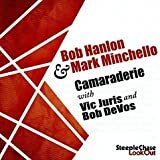 Mark Minchello brings his Hammond B3 to team up with meaty toned tenor saxist Bob Hanlon with a rotating rhythm team of Vic Juris-Bob Devos/g, Pete MacDonald-Andy Watson/dr and guest alto saxist Anton Denner for nine upbeat and toe tapping tunes. Juris’ rich tone and post bop licks work well on the peppy “Sambesque” and “Lovessence” while Devos bluesy strings stretch out on “Everything Happens to Me.” Hanlon’s horn is palpable as he flexes the biceps on “Close Your Eyes” and the rhythm team delivers a snappy and irresistible backbeat for Minchello’s Leslie’s to burst at the seams on “”Flat Tire Blues.” This one’s a blue plate special, sticking to your ribs. AH! 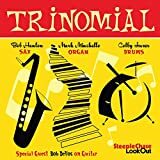 The Hammond B3 trio with sax and drums, and Hammond hitter Mark Minchello makes the team wheeze, groove and fog up an interesting and well thought collection of tunes. They keep away from the blues and instead venture into uncharted waters by doing tunes not usually associated with this genre. Wayne Shorter gets a couple songs, and both “Wild Flower” and “United” work remarkably well with smoky fog and gentle lilts on the former and a joyful sashaying dance on the latter make for some great moments. Hanlon’s tenor is molasses rich with Minchello’s deep vamps on “Blue in Green” while Hanlon’s soprano walks through the hues on his on his own “Here’s The Thyme.” Bob Devos brings his guitar in on a couple of welcome tracks, gliding through a slick groove on Hanlon’s “River” and adding some slines on “United.” The band sounds coy on the flavorful “Nobody Else But Me” and joyfully struts on Thelonious Monk’s “Eronel.” Bravo for song selection and mood creation. I get to hear albums these days that in the days when I had money to spend I would probably never have considered. A nice example is The Last of the Beboppers (FM 018) by Maciej Fortuna (trumpet), Mack Goldsbury (tenor sax), Mark Minchello (organ) and Lou Grassi (drums). The album features an original or two by each plus an arrangement of Bach's "Minuet in G."
It's straight-ahead all the way on this one. The compositions serve up a hard-bop stew and the players all gather their own expressive means to realize music in the tradition but originally so. 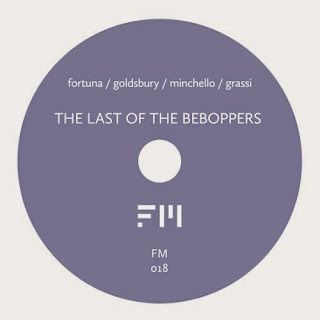 Goldsbury has fire and brimstone in his tenor, Fortuna plays a hard but lyrical trumpet, Minchello gives us the Hammond sound updated and Lou Grassi drums with conviction. I've never heard Lou in this context but he sounds very comfortable and inventive, as do the others. Do we need more straight-ahead jazz? Not just for its own sake. But when it comes across sincerely and clearly and there is something original in all they do, it is welcome. I am glad to have it and hear it.